At first, my sole reason for learning how to meal plan for two weeks at a time was the idea of a second weekend when I wouldn’t have to plan and shop. I realized I could “reuse” our bi-weekly (or monthly!) 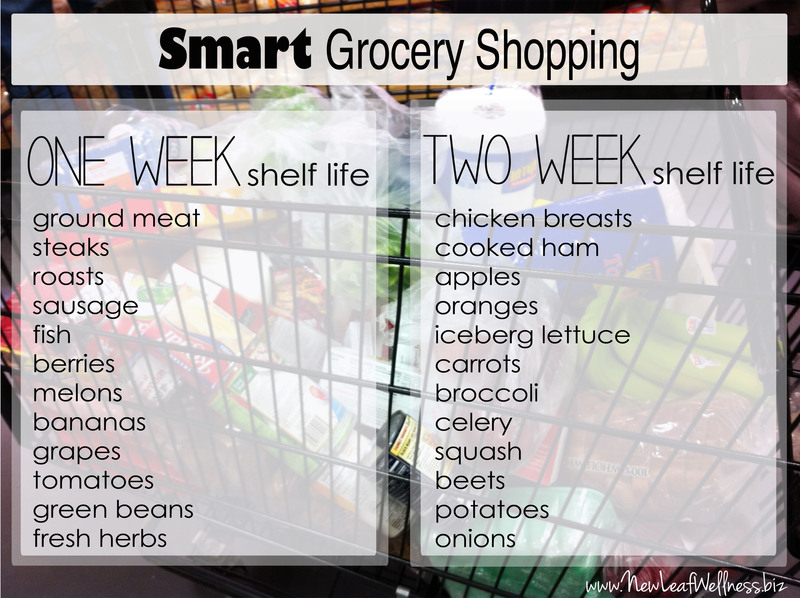 meal plans again in the future and cut out the need for meal planning altogether. Have I convinced you to meal plan for two weeks yet?!? I will admit that there were a couple of bumps in the road when we started out. To help making the learning curve easier for you, I’ve compiled the lessons that I learned about how to meal plan for two weeks and only grocery shop once. 1. Buy meats, vegetables, and fruits that have a long shelf life. If you’re going to meal plan for two weeks, you need to make sure that some of the food you buy will still be good during Week Two. I have the most luck with chicken breasts, carrots, potatoes, apples, and frozen vegetables (obviously). 2. Allocate time during Week One to freeze some food for Week Two. Even if you buy food with a long shelf life, you will probably still need to freeze some of the food that you want to eat during Week Two. This does not need to take a lot of time or be a burden. Most of my freezer-friendly recipes can be prepped and frozen in 15 minutes or less. (In a previous blog post, I shared my best freezer meal tips for beginners.) The GREAT thing about having frozen meals on-hand for Week Two is that you won’t have to cook!! 3. Get creative with fresh fruit. Most fresh fruits will spoil after one week so you will have to find creative ways to include fruit in your family’s diet during Week Two. When my husband and I create our meal plan for two weeks, we plan to use browning bananas in muffins and pancakes, freeze fresh fruit for smoothies, and take advantage of already-preserved fruits, like dried fruits and applesauce. 4. Buy extra household products. 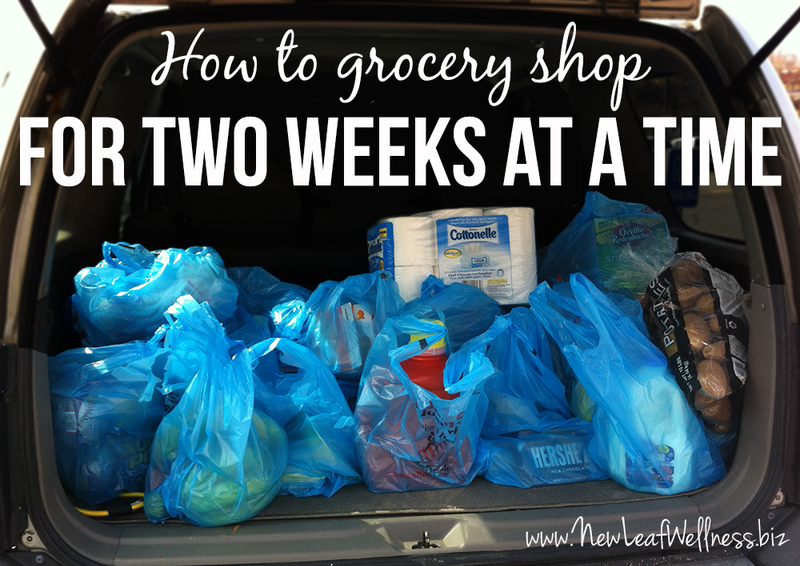 You don’t want to run out of toilet paper and have to make a second trip to the grocery store. When you create your meal plan for two weeks and write your grocery list, make sure you have back-ups of these types of items: toilet paper, napkins, paper towels, dish soap, dishwasher detergent, laundry soap, dryer sheets, tissues, bar soap, hand soap, etc. 5. Buy the ingredients for at least one extra meal, just in case. Trust me, you want to have a back-up if you forget an ingredient, you miscalculate what you need to make a recipe, your dinner plans change, etc. If you freeze your extra meal and don’t end up needing it, you can sub it into your meal plan on a night when you don’t feel like cooking or save it as your “back-up meal” for up to 3 months (most freezer meals will stay good in the freezer for that long). To make meal planning for two weeks even easier for you, here’s a simple calendar printable that you can use to brainstorm meal ideas and figure out when you’ll eat them. 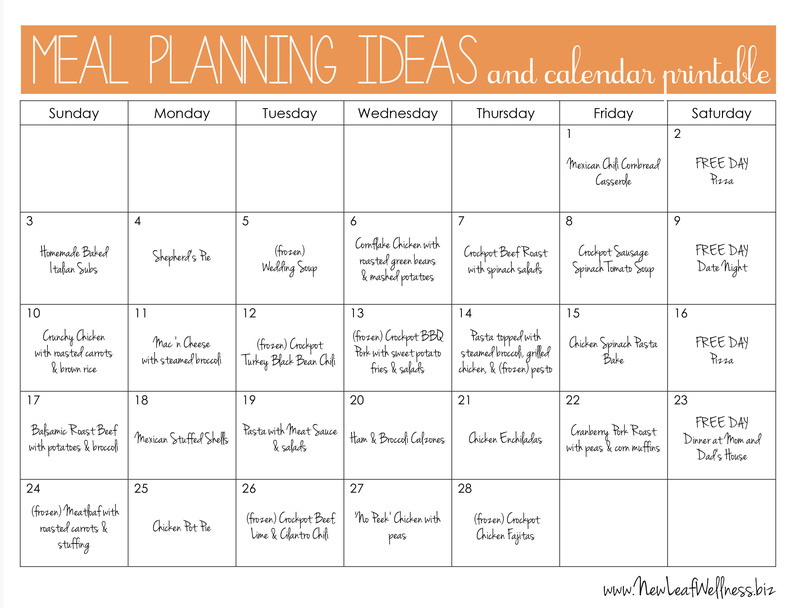 Since the meal planning calendar printable is very basic, you can use it however you want. You can label an entire month at once or start mid-month and bleed into the next month. It’s totally up to you. My husband and I like to tackle how to meal plan for two weeks together. I think it’s nice to work together and it makes sure we’re both “hungry” for the meals that we’re planning. 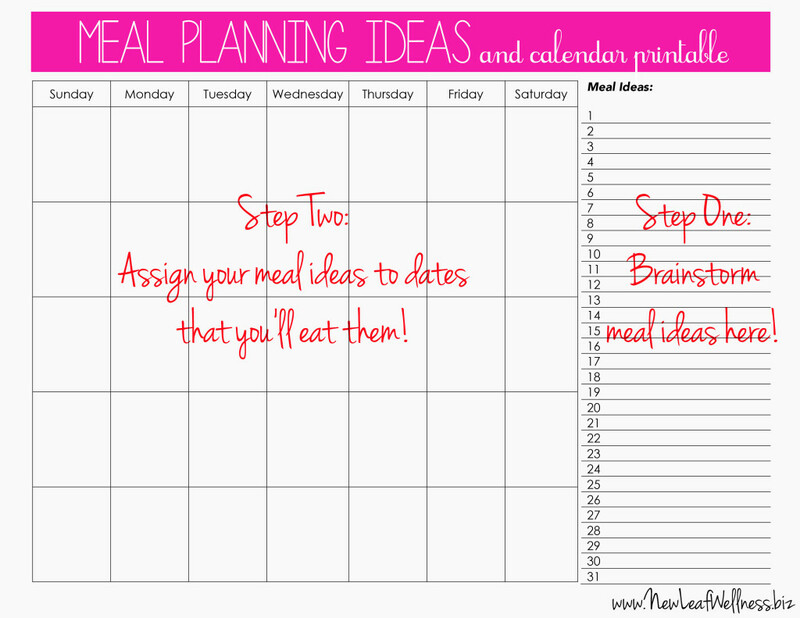 Download my FREE meal planning calendar .pdf on my website here. Print the calendar and label it with the month and upcoming dates. Brainstorm a list of meal ideas in the right column. If you’re creating a meal plan for two weeks, that would be 14 meal ideas (15 if you’re including an extra meal…or 13 if you’re like me and want one night off per week!). 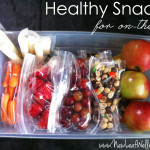 Make sure to include meals that will still be fresh Week Two (or can be frozen). Assign your meal ideas to the days when you’re going to eat them. Consider nights when you or your husband won’t be home. You may want to assign slow cooker or freezer meals to nights when you’ll be home late or won’t have time to cook. Hang your calendar in your kitchen where your whole family can see it. We also made the Crockpot Beef Roast, Ham & Broccoli Calzones, and Chicken Enchiladas from my Freezer Recipes cookbook. I hope I’ve helped you understand how to meal plan for two weeks at a time and given you the tools you need to start saving time and planning healthy, homemade meals for your family. I promise it isn’t that hard and the benefits are huge! Tell me: Do you plan your meals ahead of time? What makes you want to start now? P.S. For more meal planning tips and recipes, follow me on Pinterest @kellymcnelis! One of my fb friends posted the freezer meals link. Great idea! I’m one who dislikes leftovers and also is a working mom of two! Dinner time can be crazy! I’m grateful my husband loves to cook, but some nights we’re both tired and constantly asking “What do u want for dinner?” I can’t wait to use some of uour tips! Thanks! Thanks Kelly for the post:) I don’t really meal plan so it’s a scramble every day to fix dinner. 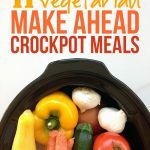 I really have wanted and needed to try meal planning for a week or two, and after I read your post about planning I now have an idea of where to even begin. I’m so glad to hear that! Try planning for a week, or even a couple of days at first. I think you’ll find that it isn’t as hard and you think and saves you lots of time and stress! Good luck!! So glad you are blogging about meal planning. I started weekly planning 16 years ago..what a life and time saver. I’m a full time business owner, mom, wife and mother of two teenagers (17 & 16) so life can get pretty hectic. 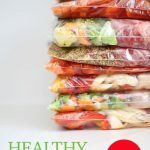 Meal planning gets into my conversation at least once a day a work, I guess I just think everyone should be trying this time saving idea 😉 thanks again for blogging about this!! Of course! Thanks for sharing! I’m glad to hear it will be helpful during the teenage years too.